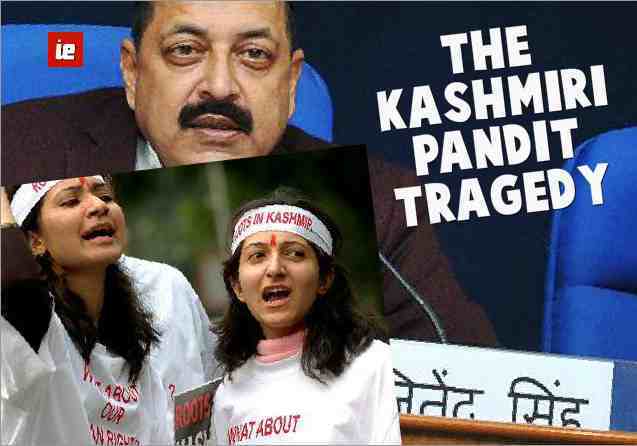 Rhetoric of return and rehabilitation of Kashmiri Pandits, anybody serious yet? Dr. Jitendra Singh is a good friend of the Pandit IDPs; he has long association with them. Very few political personalities have as comprehensive an understanding of Kashmir IDP issue as Dr. Jitendra has. He is now at a very important position in Delhi and can be effectively instrumental in addressing the issues of Kashmiri Pandits. I, therefore, feel that by supplementing his knowledge with a few more input which he might have missed owing to his preoccupations, he would be facilitated in tackling the same in right earnest. Looking in retrospect, we find that neither the central nor the state government ever seriously thought of taking the displaced community back to Kashmir valley. . The reason is that this numerically insignificant community is no political party’s vote bank. Their political disempowerment in the valley prior to their exodus in 1990 was contrived by Gerrymandering. After 1990 exodus, their country-wide dispersal snatched from their hands the logistics of franchise. If we talk of humanism in the context of extirpated community, well it is still at a good distance from political practices of the Indian state. Over the years, semi-official or pseudo-official circles gratuitously floated some formulae of their return and restitution in the valley. Back to their original homes, cluster habitats, district-wise habitats, transition camps and the rest of it, are all the figment of imagination of these circles. The rhetoric like Pandits are integral to Kashmir polity or government is committed to taking them back etc. flowed freely all these years. The IDPs took all this laughingly. Former Prime Minister Manmohan Singh’s so-called Pandit Package of 2008 was nothing short of mockery as far as the Pandit IDPs were concerned. However, it was and is a boon for so-called terror victims of the valley. Reading between the lines of the package, one finds that its framers were more concerned about the vote bank constituency in the valley than the displaced persons scattered in exile. In its election manifesto BJP made a commitment of rehabilitating them back in the valley. This is also reflected in the Agreement of Alliance between PDP and BJP. Late Chief Minister Mufti Sayeed talked to Prime Minister Modi in Delhi on the subject. They agreed to work out a formula of IDP return and concentrated rehabilitation. Both made a public announcement to this effect. When their formula was announced, all hell broke out in the valley. Entire valley staged massive protest against Pandit rehabilitation. Leaders of all hues in Kashmir --- the mainstream political parties, the Hurriyatis, separatists and secessionists, the business class and civil society ----- one and all, rose in unison to oppose the idea of concentrated rehabilitation. The valley saw unprecedented strike for one full day. They treated Kashmir as their exclusive fief. Not only that, even the legislative assembly in session at the time saw great commotion. The opposition as well as the treasury benches created a scene in the assembly hall demanding that government clarify the matter. Wild accusation of changing the demography of Kashmir was leveled. Most of the members from treasury as well as opposition raised voice and fists to demonstrate their opposition to Pandit return. The BJP members did not have the courage to counter the protest. They sealed their lips and remained pathetic spectators of a frenzy in the assembly with clear communal underpinnings. The then chief minister retracted and said that the Pandits may come and go back to their homes. Not a single sane voice was raised in a house of 84 members to ask the Chief Minister where the abandoned houses of the Pandits are. Kashmiriyat zindabad. BJP has not the nerve either to take any decision on the module of return and rehabilitation and implement it, or ask the state government to implement it come what may. This is a conflict between the vote-bank democracy and religion-based mobocracy. So far, the latter has had the upper hand. Therefore, before the MOS advises Kashmir IDPs to “formulate one opinion” about return and rehabilitation, he will need to make a resolve whether his government is capable of coping with the question. As regards single opinion from the displaced community, it was formed twenty-six years ago, viz. the Pandit Margdarshan Resolution of 1990 in which the entire community represented by 3,500 delegates demanded a separate homeland in the valley. So far no mainstream political party in the country formally reacted to this unanimous resolution. Assuming it did not suit them, what is their argument? Indian state neither came out with its reaction nor engaged us in any open and meaningful debate on this resolution. Does it not show that the central government felt talking to Pandits as something below its dignity while supplicating for talks with the separatists and militant leaders as something that added to its dignity. This syndrome, the hang-over of slavery is in place even today. Sensing that the Indian State had unknown reservations in accepting the homeland, the Pandit think-tank came out with more accommodative formula of a twin-city with composite habitation. In doing so, they gave more space to secularist dispensation notwithstanding the fact that community’s extirpation from Kashmir had torn Kashmir secularism to shreds. Kashmir IDPs interacted with the Team Interlocutors led by Dilip Padgaonkar, and appointed by the previous government in Delhi. They were convinced and recommended to the Government of India that a twin-city of Srinagar accommodating the displaced Pandits and others would be an ideal, sensible and viable solution to the issue of restitution of the IDPs. The team went to the length of proposing the name of the twin city as Nova Srinagar. Why did not the previous government react on that and why does not Modi government pull it out of cold store? Is it not the “single opinion” the MOS advises the Pandit community to formulate? Does “single opinion” mean an opinion that suits the policy makers in Delhi? Unfortunately, Dr. Jitendra Singh also seems to be carried away by the malicious propaganda unleashed against Pandit community that it is divided and cannot form a single opinion. It is the patent method of hiding their inherent inability of coping with the situation, and thus passing the buck on to Pandit IDPs. The reality is that BJP like Congress is incapable of mustering courage of telling Kashmiri leadership and the people at large that the minuscule Hindu minority of the valley was forced out of their homes at the point of gun ---- which Indian security forces are still fighting against. Therefore, being the indigenous people of the valley, they have every right to return and restitute in any way and any where according to their free choice. They have a right on the land, its air, water and its flora and fauna. Their cultural impress is on every mountain, hillock, lake, spring and stream of Kashmir. They have a right on its political and administrative indulgence and they have a right to contribute to its development. They have a right to pursue their faith and culture. This right is enshrined not only in the Constitution of India and of J&K but also in the UN Declaration on Human Rights to which the Union of India is a signatory. No government either in Srinagar or in Delhi should think that rehabilitating the Pandits back in the valley amounts to obliging them. The rulers of this land need to cleanse their conscience of the blot of failing to protect the minority people and their property against violence and vandalism in 1990. In final analysis, Dr. Jitendra Singh should take up the two consensual options of rehabilitation offered by the Pandits, initiate a meaningful debate in the highest circles of the party and the government and come out with a final proposal for the approval of the displaced community. We are aware that trumpeting on every available platform the commitment of the government and the party to the return and rehabilitation of displaced persons is only to sidetrack the core of the issue. As long as the two options laid by the Pandits on the table are not debated with earnestness and sidetracking of the core issue is resorted to, return of the native remains only propaganda stuff. Indian Exponent: Rhetoric of return and rehabilitation of Kashmiri Pandits, anybody serious yet?